Welcome to the initial in what I like to call the 'first look' series of posts for Flintloque and Slaughterloo. Its not how we used to show off new miniatures. We used to wait until they were released before showing them but the world moves on and it now the done thing to show miniatures before release and so here we are. First look will show you either the 'greens' (original sculpts) by the designer or the first 'master tins' made of them. Raw and without being painted or based with high resolution images so you can see them as they are and then upon release as they can be in our official uniforms for that unit in the games of Flintloque and Slaughterloo. This a set of 28mm white metal and resin miniatures full of character. Officers both foot and mounted used to command your Von Rotte or any other Finklestein Dwarves in your forces. Four officers on foot suitable for command of line infantry, elite infantry, light infantry or artillery. In keeping with the Slaughterloo officer types we have an Aggressive, a Dastardly, a Heroic and a Cowardly officer. In the image here these are from the left the Heroic officer in tricorne with bier stein, a Cowardly officer with pocket watch open a monocle and a worried expression. Next a bare headed Dastardly officer with a telescope and tricorne under his arm. Lastly the Aggressive officer charging head long with a sword raised and beard a flowing. There are also two mounted officers on our newly made to resin Pummilig Pigs the favourite mount of Valon Dwarves. A lesser and greater officer suitable for commanding your division, your section or as aide de camps. One is bare headed with a war hammer raised while the other sports a tricorne and a raised pistol. This set has a place in a Dwarf player's collection alongside the existing ones 52506 Krautian Dwarf Command Set and the 52507 Finklestein Dwarf Command Set giving armies the personality officers they want. 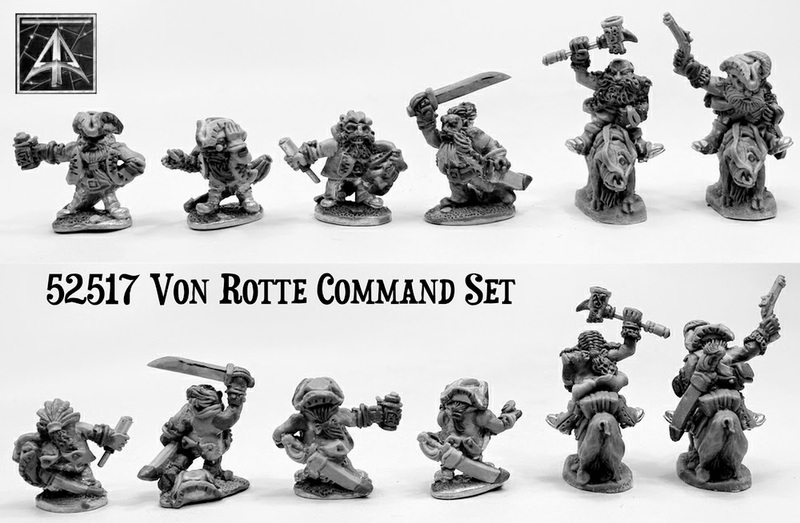 This set will form our three days of festivemass offer meaning that 52517 Von Rotte Command Set will appear on our website on our new Von Rotte Legion page for three days only at 20% off its release price (14.40GBP rather than 18.00GBP). The actual release date is 8th January 2015 which is when the painted set along with game statistics for the code will online but you can save 20% by ordering on the 24th , 25th or 26th December 2014. We will ship your set out to you, plus anything else you order, before the official release in the new year and you will have it before anyone else globally. 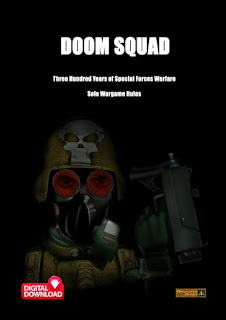 A great offer and a fantastic start to the Von Rotte Legion expansion. Mark your calendars and when the madness of Christmas Day is over for you take a moment for yourself and pick up a brilliant set of Napoleonique Dwarves created by our in house art, design and sculpting team headed by Sam Croes. The next Von Rotte code will be 'first looked' in January 2015... I can already smell the black powder smoke.